A five-generation family recently met for a photo. Pictured in the front row are great-great-grandparents Viola and Robert Fogt, of Sidney. Back row, left to right, great-grandmother Sharon Aselage, of Wapakoneta, mom Ashley McDonald holding Grayson McDonald, both of Lima, and grandfather Kenneth Aselage, of Anna. https://www.sidneydailynews.com/wp-content/uploads/sites/47/2019/01/web1_Aselage-1.jpgA five-generation family recently met for a photo. Pictured in the front row are great-great-grandparents Viola and Robert Fogt, of Sidney. 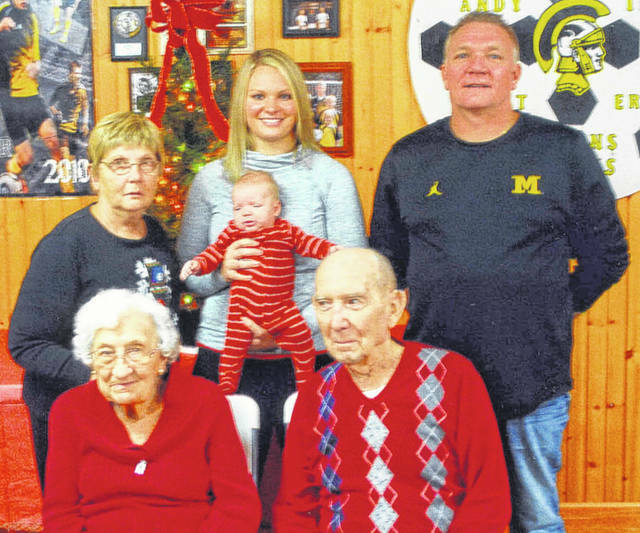 Back row, left to right, great-grandmother Sharon Aselage, of Wapakoneta, mom Ashley McDonald holding Grayson McDonald, both of Lima, and grandfather Kenneth Aselage, of Anna.